It was a delight... I just can't fully explain the wonderful time we all had. You have helped make some wonderful lifetime memories for me and my grandchildren. Thank you so much! WONDERFUL, WONDERFUL, WONDERFUL. And the whole community is great. Every place we went we were treated with such great hospitality. Your team was amazing. It started when we made the reservation on the phone and the agent was so very friendly and helpful. The staff was kind enough to call us and let us know our unit was ready for occupancy. When we arrived the check-in was effortless and the staff was so very friendly. 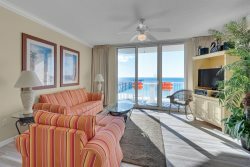 The absolute best experience we have had with a beach rental team! Thanks for making it effortless. The condo was so very clean and stocked with everything we needed. The wraparound balcony was amazing and we so enjoyed just sitting out there enjoying the beautiful view. Even though it rained quite a bit while we were there, we still had a great time thanks to the beautiful condo and the wraparound balcony. Sarah called to let us know that our condo was ready right as we were driving over the bridge. When I got there she remembered me and had my stuff ready. That was the quickest check-in ever. We have stayed at Sunset Harbor many times, mostly in this unit. We love the well stocked units. They are well cared for as well. We enjoy the slower pace of Navarre Beach. I'm so happy that the eating options have grown over the years, so that we don't have to make trips to Destin and Pensacola every night. Really enjoyed the stay - the view, beach, pool and hot tub were terrific.